In order to ensure that models can be meaningfully and objectively compared between the different manufacturers, the size, wall thickness and features of the test coldrooms were clearly specified and tested under identical conditions, managed by the ATP test by TÜV Süd. Two trials were carried out: Determination of the overall heat-transfer coefficient (k-value) of the cold rooms using a source of heat, and determination of energy efficiency, using a source of cold. The coldrooms from Viessmann Kühlsysteme GmbH set themselves apart with their outstanding insulation properties and the high energy efficiency this enables. On the one hand, this is supported by the results of the TÜV inspection of the measured foam insulation values (U-values), and on the other hand is also demonstrated by the recorded thermal images. The Viessman coldroom with improved foam even surpassed the excellent result achieved by the previous technology. The thermal imaging conducted by TÜV Süd during operation highlights the result of the TÜV test. 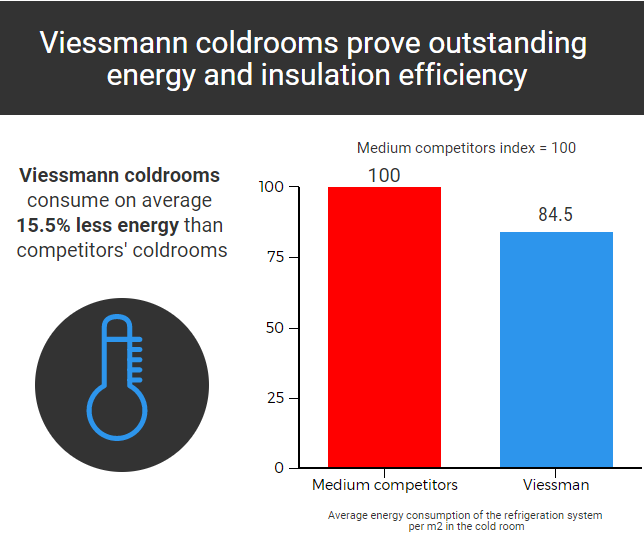 The pictures clearly showed that the outside temperature of the Viessmann cold room was higher than the general value of the participants in the competitive comparison. This indicates that the insulation allows less cold to escape outside. In addition, the images showed significant thermal bridges in the joint areas of many competitors’ cold rooms. The corner post system showed that even these corner points represent a weak thermal point in the overall system.